Not many know this, but in the medieval days, Basel was a walled city complete with city gates. Three of these city gates still stand and the most beautiful and grandest one of them all is the Gate of Spalen, or the Spalentor. A historical landmark in the city, the city gate presents a piece of story of how Basel was in the 14th century. 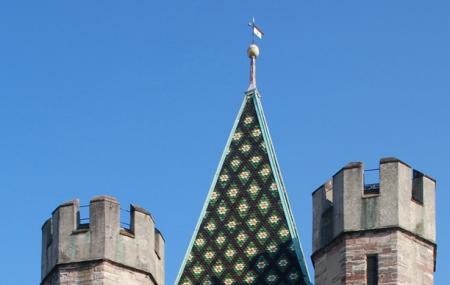 Don’t miss out on the Basel Coat of Arms that dominates the top of the gate. Since the Spalentor is placed at in an open space, it has no business hours. People normally club together Sonnenbad St. Margarethen and Historisches Museum Barfüsser Platz while planning their visit to Spalentor. Absolutely, the most beautiful part of Basel! Full of visible historical landmarks and quirky shops (like Johann Wanner Christmas shop), cafes and restaurants. Picture perfect!! A Beautiful Structure build. Very old. I went with my classmates there! Supposed to be a three star Hotel, but seemed more like a 4 star. Could only imagine how nice a 5 star hotel in Basel is. Beautiful hotel and close to historical district. Amazing staff. Would recommend to anyone visiting Basel, Switzerland. The Spalentor is the end of my favourite street in Basel. I reccomend that you walk from the Universität to here through the beautiful street leading to it. The Spalentor itself is very pretty and one of the remnants of the very old part of the town. I take all my visitors there and recommend to walk by it if you can.